Following yesterday's release of iOS 6.1.3, which fixed two bugs allowing the iPhone's passcode lock to be bypassed, another passcode security flaw has been discovered. 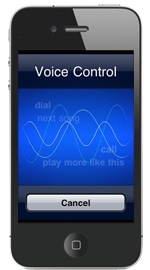 The vulnerability, which only affects the iPhone 4, involves the Voice Dial command, as demonstrated in the video below from YouTube user videosdebarraquito. iPhoneinCanada tested the method in the video using an iPhone 4 running iOS 6.1.3 and found that the security flaw does indeed exist, giving a potential intruder access to both contacts and photos. Like the previous passcode vulnerability, the current hack involves a complicated set of steps that includes initiating Voice Dial command and quickly ejecting the phone's SIM card. When the SIM card is removed, the phone opens the recent call log, which gives access to the contact list. In the contact list, adding a photo also gives access to all of the pictures on the device. The previous passcode vulnerability was discovered in mid-February, and it took Apple more than a month to push a fix. An update for the current bypass could follow a similar timeline, but the vulnerability can be fixed by disabling Voice Dial from the Passcode Lock menu. At this time, the vulnerability has only been shown to work with the iPhone 4. We were unable to reproduce the results with an iPhone 5 with Siri disabled, though the bug may potentially affect the pre-Siri iPhone 3GS as well. Update 1:07 PM: iPhoneBlog.de reports that it has reproduced the issue on an iPhone 5 with Siri disabled, although we have still been unable to do so. Wow, who figures this stuff out? What's next? Stand on your head, rub your stomach while ejecting the SIM 3 times with 1.5 second pauses in between each one. Does anyone even use the iPhone 4 anymore? Not sure if you're joking or not. In Canada, we have 3-year contracts so many of us are still using the iPhone 4. My contract doesn't expire until this August. Iphones don't suddenly expire when a new comes out you know...My wife has a 4 and it works perfectly, she has absolutely no desire or need whatsoever to upgrade..for what! This is ridiculous. I understand that this is insecure but who the hell comes up with such an elaborate way to access just your phone and photos? Your phone's still safe from the average Joe. I'm just glad that Macrumors posted this. Complicated as it is, we want to make sure that criminals everywhere with stolen iPhone 4's will have no trouble accessing them. Jeez, for months it was "Apple doesn't need a low-cost phone. That's what the iPhone 4 and 4s are for." Now when another security flaw is uncovered, it's "Does anyone even use the iPhone 4?"